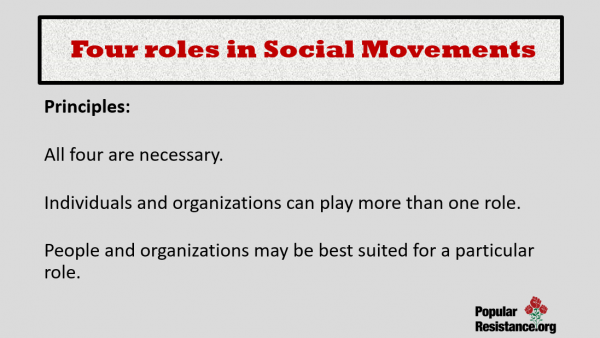 We review the four roles that individuals and organizations play in a social movement and what makes them more or less effective. 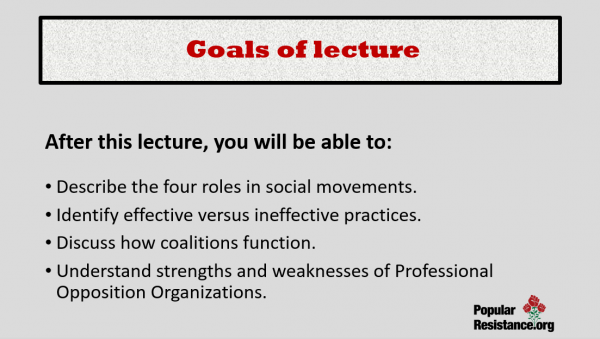 We also discuss how coalitions function and basic principles for making them effective. 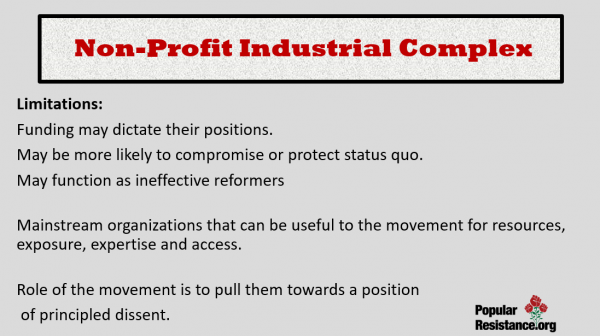 Finally, we discuss the non-profit industrial complex. 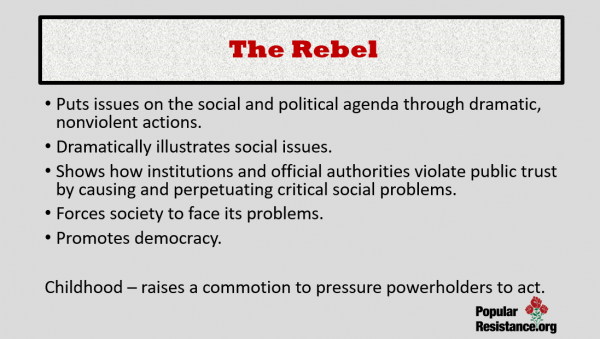 The rebel is the kind of activist many people identify with social movements. Through nonviolent direct actions and publicly saying “no”, rebels put the problem on the political agenda. But they can be ineffective by identifying themselves as the lonely voice on society’s fringe and playing the militant radical. 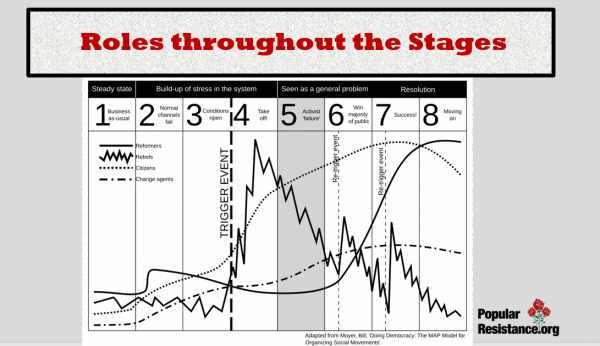 Rebels are important in Stages 3 and 4 and after any trigger event, but they usually move over to other ripening movements in Stage 6 or later. 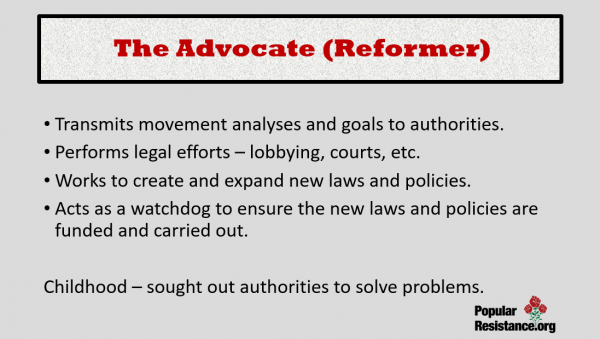 Reformers are often badly valued in movements, but they are the ones who prove the failure of existing channels or promote alternative solutions. However, they often tend to believe in the institutions or propose reforms too small to consolidate the movement’s success. Citizens make sure the movement doesn’t lose contact with its main constituency. They show that the movement acts at the centre of society (teachers, physicians, and farmers participating in the Gorleben protests), and protect it against oppression. They can be ineffective when they still believe in the powerholders’ claim to serve public interests. 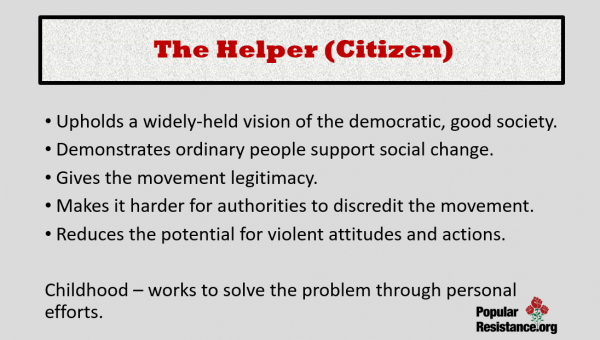 Many activists and groups identify primarily with only one or two of the four roles, because each involves different emotions and attitudes, beliefs, ideologies, sources of funding, political and, often, organisational arrangements. Activists can be critical – or even hostile – to those playing other roles. Activists tend to consider the roles they play as the most important and politically correct one, while viewing other roles as naive, politically incorrect, ineffective, or, even, as the enemy. 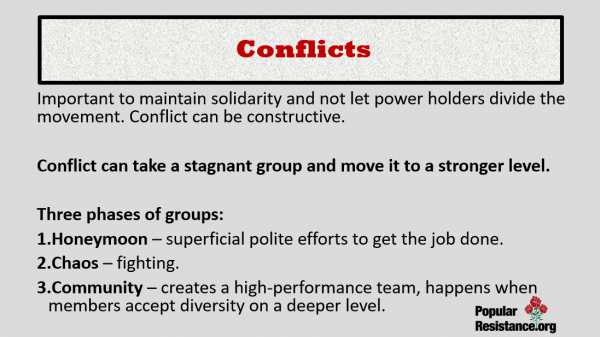 The “ability to build coalitions is a basic skill for those who wish to attain and maintain power and influence.” Through coalitions, weaker parties to a conflict can increase their power. 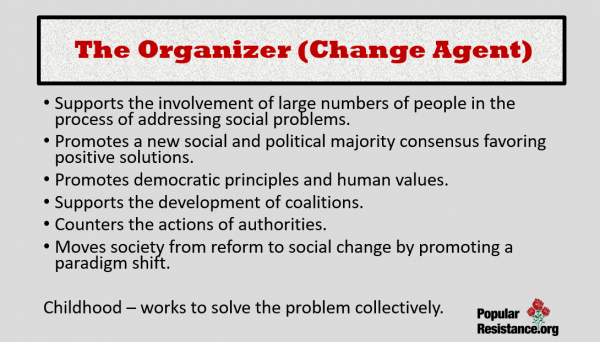 Coalition building is the “primary mechanism through which disempowered parties can develop their power base and thereby better defend their interests.” Coalitions may be built around any issue and at any scale of society, from neighborhood issues to international conflict. 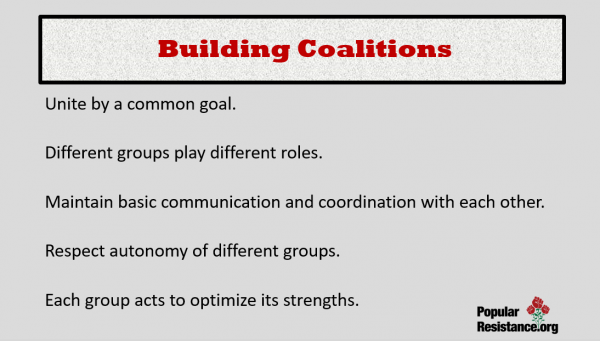 A coalition will increase the impact of each organization’s effort. Involvement in a coalition means there are more people who have a better understanding of your issues and more people advocating for your side. A coalition may raise its members’ public profiles by broadening the range of groups involved in a conflict. The activities of a coalition are likely to receive more media attention than those of any individual organization. A coalition can build a lasting base for change. 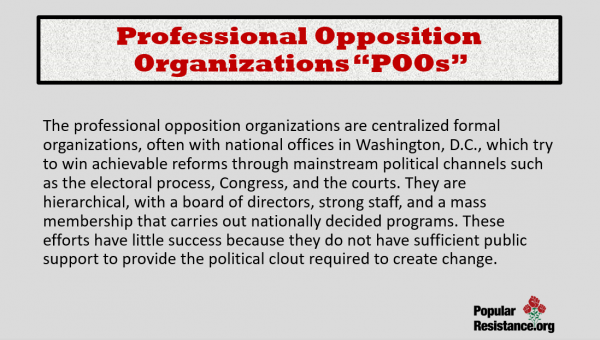 Once groups unite, each group’s vision of change broadens and it becomes more difficult for opposition groups to disregard the coalition’s efforts as dismissible or as special interests. A successful coalition is made up of people who have never worked together before. Coming from diverse backgrounds and different viewpoints, they have to figure out how to respect each other’s differences and get something big accomplished. They have to figure out how each group and its representatives can make their different but valuable contributions to the overall strategy for change. This helps avoid duplication of efforts and improve communication among key players. A coalition may only be as strong as its weakest link. Each member organization will have different levels of resources and experience as well as different internal problems. Organizations that provide a lot of resources and leadership may get frustrated with other members’ shortcomings. Deciding whether to join a coalition is both a rational and an emotional decision. Rationally, one must consider whether one’s effectiveness and one’s ability to attain one’s own goals would be enhanced or harmed by participation in a coalition. Emotionally, one must consider whether one likes the other people or groups, and whether cooperating with them would be easy, or more trouble than it is worth. Usually when two people, groups, or organizations’ goals are compatible, forming a coalition is to both groups’ benefit. But organizational styles, cultures, and relationships must be considered as well before any choices are made. 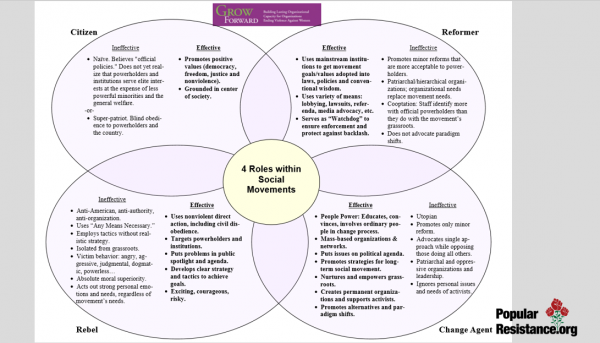 What Role Were You Born to Play in Social Change? By George Lakey, 2016. Building Our Muscles for Conflict by George Lakey, 2013. 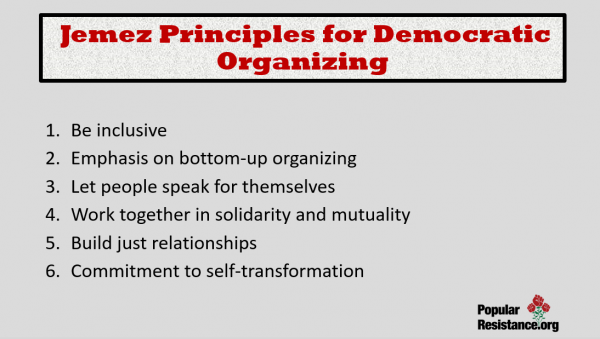 Jemez Principles for Democratic Organizing, 1996.